Everyone tells you marriage is hard, but no one tells you what to do about it. At age thirty-four, Jo Piazza got her romantic-comedy ending when she met the man of her dreams on a boat in the Galápagos Islands and was engaged three months later. But before long, Jo found herself riddled with questions. How do you make a marriage work in a world where you no longer need to be married? How does an independent, strong-willed feminist become someone’s partner—all the time? 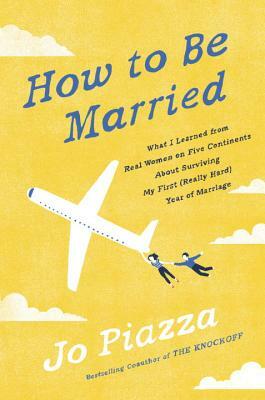 In the tradition of writers such as Nora Ephron and Elizabeth Gilbert, award-winning journalist and nationally bestselling author Jo Piazza writes a provocative memoir of a real first year of marriage that will forever change the way we look at matrimony. A travel editor constantly on the move, Jo journeys to twenty countries on five continents to figure out what modern marriage means. Throughout this stunning, funny, warm, and wise personal narrative, she gleans wisdom from matrilineal tribeswomen, French ladies who lunch, Orthodox Jewish moms, Swedish stay-at-home dads, polygamous warriors, and Dutch prostitutes. Written with refreshing candor, elegant prose, astute reporting, and hilarious insight into the human psyche, How to Be Married offers an honest portrait of an utterly charming couple. When life throws more at them than they ever expected—a terrifying health diagnosis, sick parents to care for, unemployment—they ultimately create a fresh understanding of what it means to be equal partners during the good and bad times. Through their journey, they reveal a framework that will help the rest of us keep our marriages strong, from engagement into the newlywed years and beyond. JO PIAZZA is an award-winning journalist and the bestselling coauthor of the novel The Knockoff. Her work has appeared in the Wall Street Journal, New York Times, New York magazine, Glamour, Elle, Time, Marie Claire, the Daily Beast, and Slate. She is also the author of the critically acclaimed Celebrity, Inc.: How Famous People Make Money; and If Nuns Ruled the World: Ten Sisters on a Mission. She holds an undergraduate degree in economics from the University of Pennsylvania, a master's in journalism from Columbia University, and a master's in religious studies from New York University. She lives in San Francisco with her husband Nick and their giant dog.